Several videos of the SLT REVEAL are available on the CCC Facebook page. 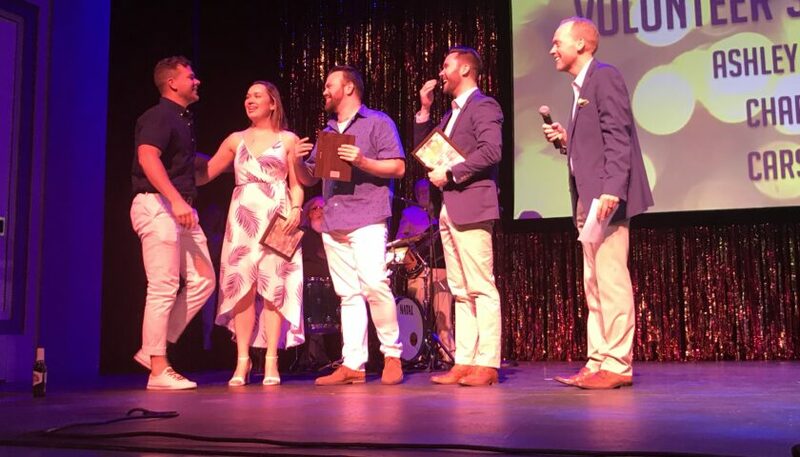 Amid rowdy fanfare, Greek delectables, and vats of a mysterious blue island libation called Windex, Spartanburg Little Theatre hosted the theatre party of the year tonight as Executive Artistic Director Jay Coffman, now in his 11th year at SLT, announced the company’s 74th season. And none of next year’s six shows have ever been done at SLT. Opening the fall season in September – if you didn’t guess from the evening’s Greek-themed “A Summer Night in Santorini” – the ever-popular and durable “Mamma Mia!” A crowd pleaser with many great parts for actors and music that no one with a pulse can resist, “Mamma Mia!”, while it has made the rounds in the Upstate, will never age and is a sure-fire sellout to start the new year. In November, SLT stages the Agatha Christie classic whodunit “And Then There Were None,” represented here with a scene (sans two dead houseguests) with an impeccable cast and ending with a hilarious line and facial expression by Richard Beveridge. In March, SLT presents the South Carolina premiere of the stage adaption of “Terms of Endearment, “based on the popular book and tearjerker Oscar-winning film. And Coffman chose a particularly frisky scene between Aurora (Susie Kocher) and Garrett (Robert Searle) on their first date. This play, like “Calendar Girls,” “Steel Magnolias,” and “The Dixie Swim Club” is bound to bring out the ladies and the tears. 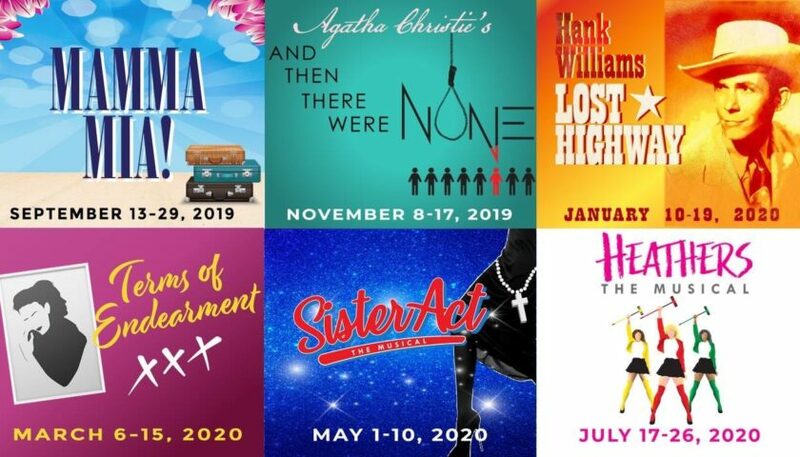 The final show of the 2019-2020 season is also a newish musical that’s been performed a few times in the Upstate (including on this very stage two years ago by Spartanburg Hugh School), but is sure to win hearts and souls next May – “Sister Act: The Musical.” Reprising her role from the definitive local professional version at Centre Stage in Greenville a couple seasons back, was none other than the fabulous Simone Mack –Orr with “Fabulous, Baby!” But will Simone jump back in the habit next year as our heroine Delores Van Cartier who leads a decrepit choir to infamy while on the run from the mob? Keep your rosaries crossed, sister! 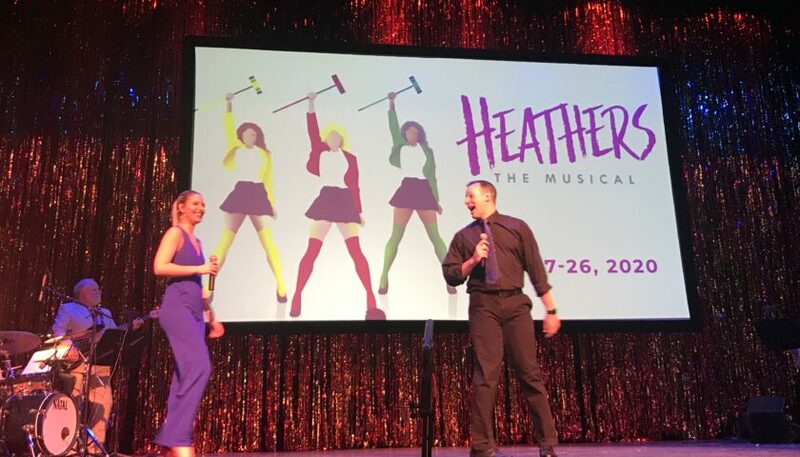 And for SLT’s Fringe Series summer show, Coffman choice the dark comedy “Heathers: The Musical.” Based on the cult film starring Wynona Ryder, Christian Slater and Shannon Doherty, this version will be the largest production of “Heathers” to date in the Upstate. Anna Lee Altman and Luke Holt performed the song “Seventeen” from the musical. Anna Lee Altman and Luke Holt sing “Seventeen” from HEATHERS. Coffman also awarded the BEV Volunteer award to some younger deserving volunteers: Ashley Zimmerman, Carson Wolfe and Charlie Hyatt. To sum up the new season and the Reveal concert, Coffman and the SLT Board have upped their game this year with a live band (Ben Chumley, Shawn Allen, Josh Tennant and Kevin Heuer), off-book scenes, costumes and choreography. 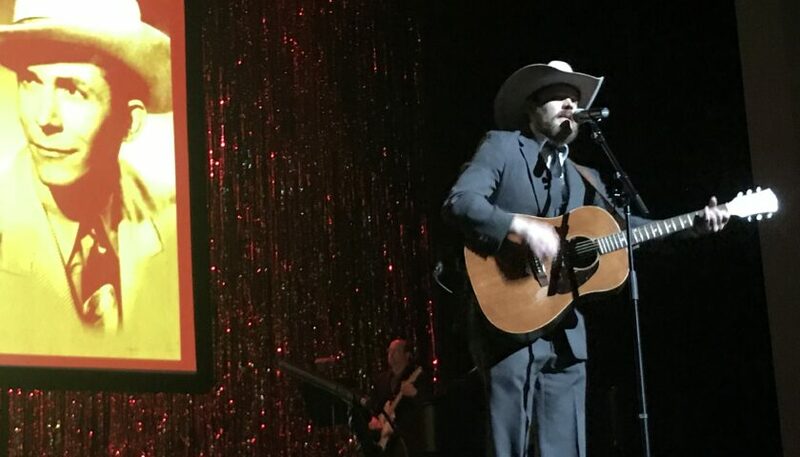 covered all their bases and patrons have an eclectic slate of shows to salivate over: popular new shows, a classic play, a new play and a country western show that could duplicate the success of “Ring of Fire,” the sold-out Johnny Cash jukebox musical. And bellbottoms, Kleenexes, habits and scrunchies off to SLT for creating soooooooo many great roles for women next season! 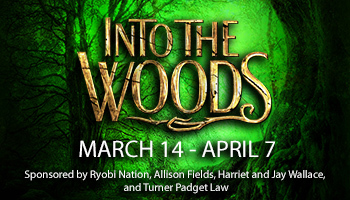 Season tickets are already available for purchase at http://www.spartanburglittletheatre.org. How much are the season tickets. When do they go on sale? 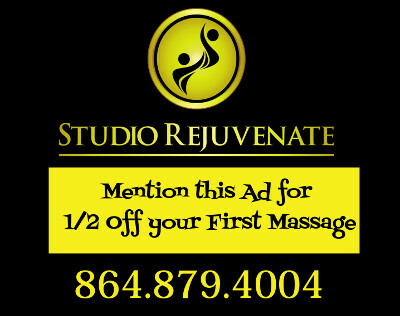 Not sure about prices but available now.